Elephants are part of the fabric of Hindu and Buddhist religions. Two important examples are the elephant-headed Hindu deity, Ganesha, and the white elephant in the conception story of the Buddha. Having an elephant at a temple is meant to bring fortune and good luck. It is also used to draw tourists and locals. Tuskers, or elephants with tusks, are especially prized. 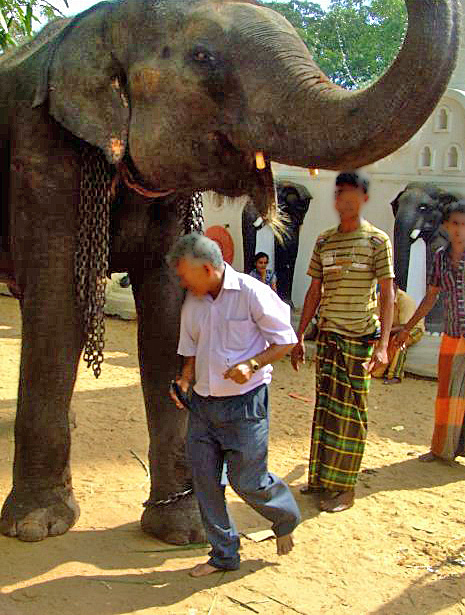 Temple elephants are not working directly in the tourism industry, but tourists will often see them in countries such as Sri Lanka and India. 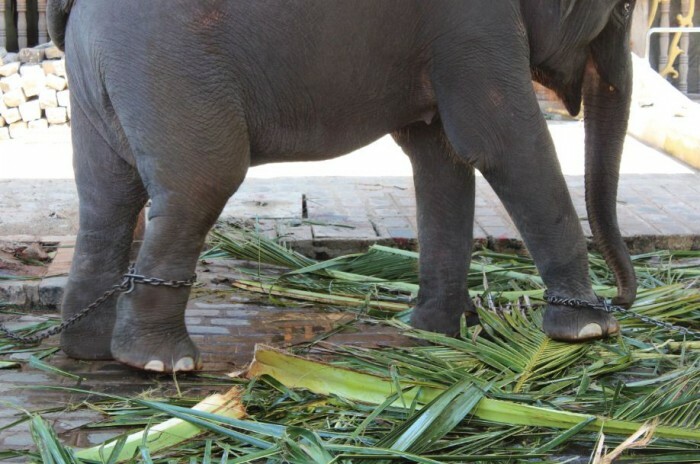 Unfortunately, most people are unaware that temple captivity is an unacceptable and unhealthy way to keep an elephant. 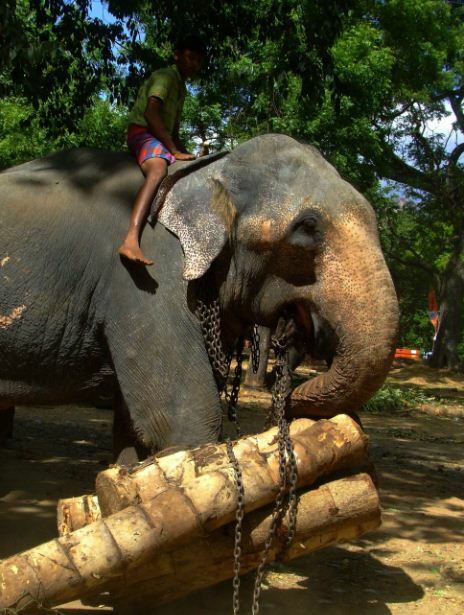 The lives of temple elephants are filled with stress, boredom, isolation, physical pain, and psychological suffering. They are chained in one spot for extensive periods of time, often on hard surfaces. A very short chain attached to a post is used to keep the elephant in one place. Sometimes, two chains pulling in opposite directions, one on a front leg and one on hind leg, are used to secure the elephant in place. 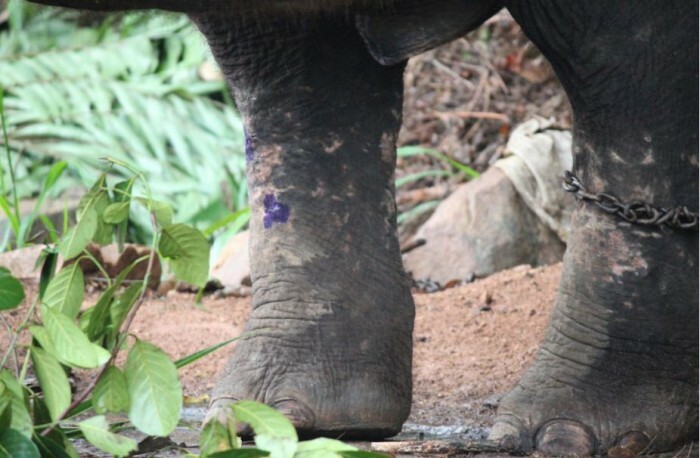 This excessive use of chains keeps the elephant facing only one direction, greatly limits movement, and makes it impossible for it to turn around. Unable to move freely, the elephant becomes distraught, frustrated, and severely stressed. In these cases, stereotypical behavior such as rocking, swinging, and pulling against the chains will often be seen. The claim that a rocking elephant is showing happiness by dancing is an absolute lie. With time, the chains will cause cuts, wounds, and dangerous infections which can be life threatening. Temples are religious structures meant for worship. 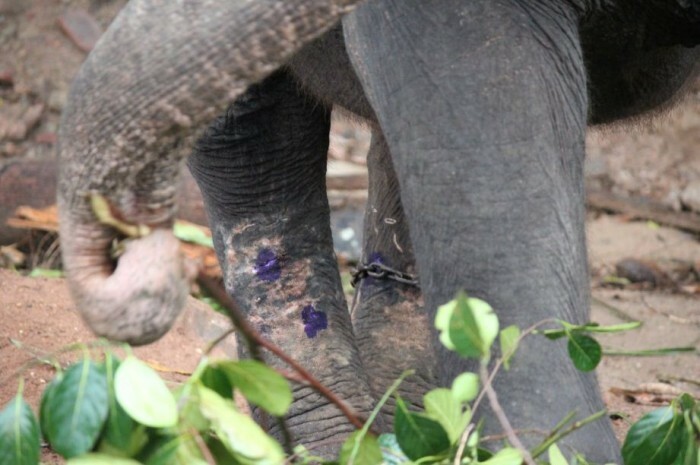 They are not equipped with the facilities to adequately care for an elephant. A temple elephant’s basic needs are never fully met. For example, a wild elephant spends 18 hours a day foraging and may drink up to 200 liters of water. At a temple, access to fresh water and a variety of food is never available on a consistent basis. During the hottest part of the day, a wild elephant will seek shade to keep cool and spread dirt on its skin to protect it from the hot sun. They spend a considerable time in water, cooling their bodies, softening their skin, and having mud baths. At a temple, a lack of shade and access to a body of water can be a serious problem leading to skin irritations, discomfort, and sunburn. Elephants are naturally highly sociable animals. Females and young elephants live together in herds with visits from adult males. The young elephants spend a great deal of time playing with their herd members. Even if there are several elephants at a temple, each animal is kept isolated, deprived of contact and social time with others. 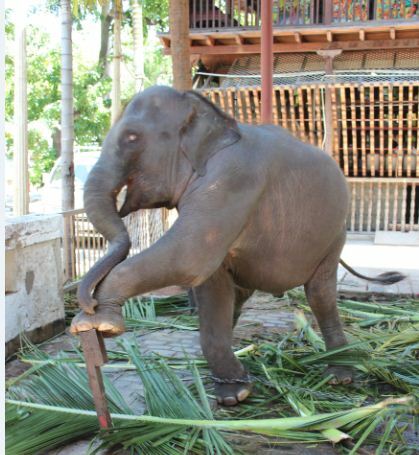 Temple work is not the only burden these elephants endure. They are made to participate in religious processions in both Sri Lanka and India’s southern Kerala region. These festivals can last for days. 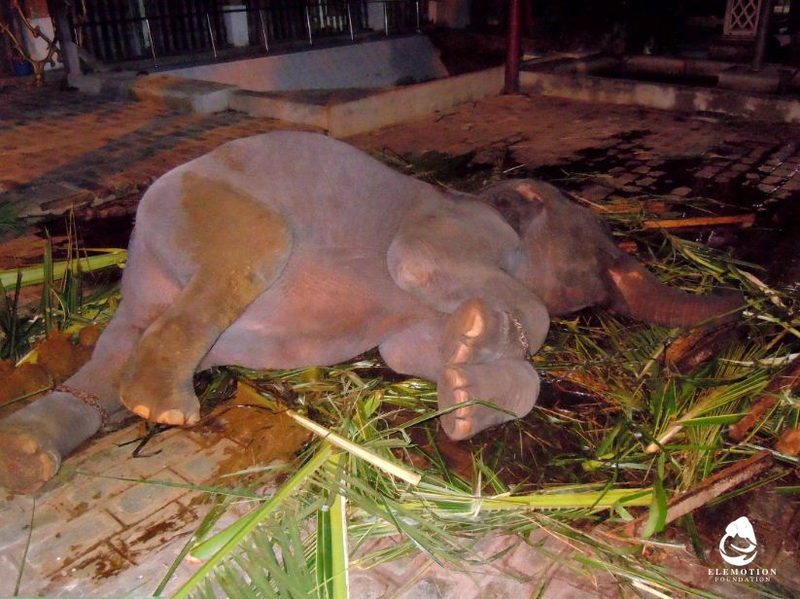 The elephants are deprived of food, vital water, and sleep, and they are surrounded by lights, people, and noise. The processions can be extremely stressful. During the festival season, the elephants will travel from one procession to another. After the season is over, many of the elephants are very weak, malnourished, dehydrated, aggressive, and ill. 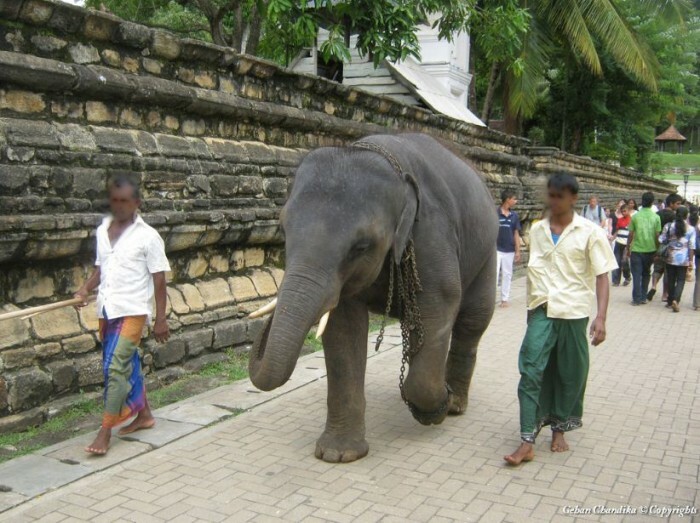 In Sri Lanka, when not fulfilling their religious duties, some of these elephants will even be rented out to give rides to tourists in elephant back safari attractions. Who is responsible for these elephants? Some may belong to the temple itself or to religious leaders such as a high ranking monk. 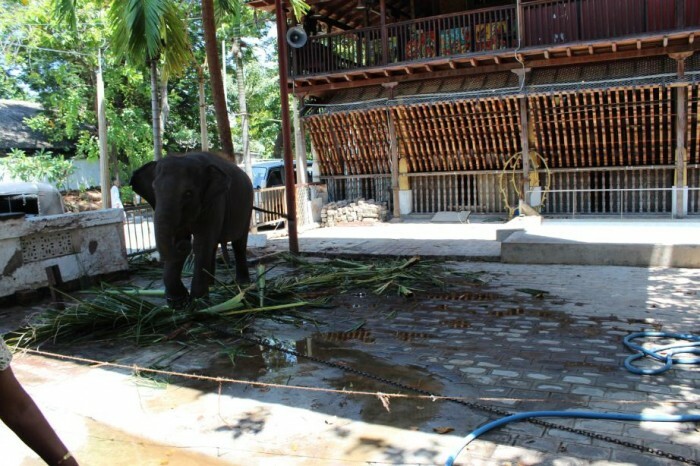 Other elephants are rented to the temple by the owner. In Sri Lanka, the owner is oftentimes a politician or wealthy business man. 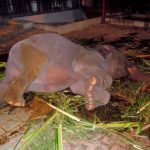 Although the animal is clearly suffering, money and status are the main drivers in keeping these elephants working. The elephant’s immediate care is trusted to a mahout who will try to coax visitors to feed or take a picture with the elephant for a tip. 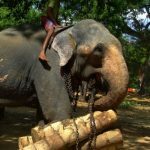 Considering that the mahout’s salary can be less than 200 US$ a month, the incentive to earn tips may be great. Elemotion Foundation is sensitive to cultural and religious traditions. However, we believe that the wellbeing of these elephants, especially in the name of religion, can be greatly improved. 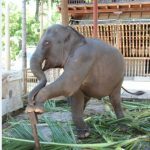 Perhaps, with the right amount of sensitivity and awareness, these traditions can be modified so the elephants will be given the respect and care they deserve. 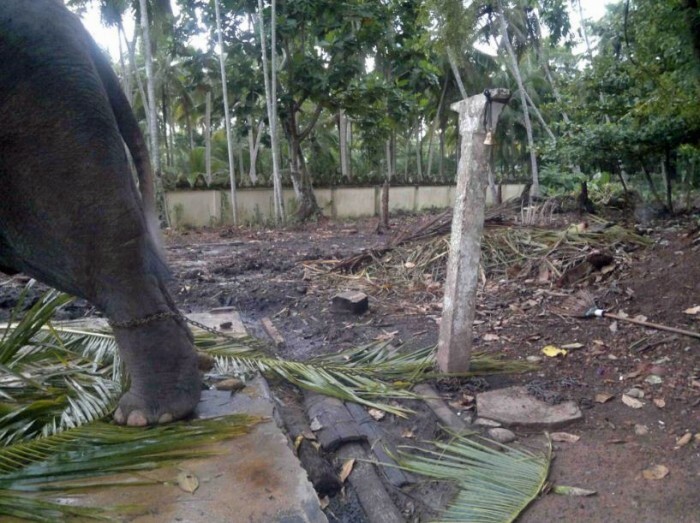 Do not tip the mahout to feed, be blessed, or take a photo with a temple elephant. If you feel compelled to feed the elephant, come to the temple with your own clean vegetables or fruits, such as bananas. Ask the mahout if you may give the elephant the food. Keep a safe distance, hand the food to the elephant, or drop it on the ground close to its trunk. Be aware that the mahout may be unhappy when he does not receive a tip from you. You may question the head monk about the condition of the elephant. Perhaps, you may start a polite conversation about Buddhism and end it by expressing your concern over the elephant’s welfare. Point out the nervous behaviors, lack of clean food and water, and chain wounds, if any. Hopefully, the monk will be sensitive to the animal’s suffering. Always be respectful and behave appropriately when in a temple. Write a polite letter to the head monk and the governmental offices in charge of religion, tourism, and economics. Write a polite letter to the Sri Lankan or Indian embassy in your country. Educate your friends and family about the truth behind temple elephants.